Ling Yan Zhang was born and raised in the city of Shenyang in northern China. Both her mother and father were art professors who taught Chinese traditional painting at Luxun Academy of Fine Art in Shenyang. Ling has two sisters, Bo who is an artist and art broker and primarily a printmaker, and Hong, an artist who is best known for her beautiful, hair themed charcoal on paper works. Due to the artistic influence of her parents, Ling received a Master of Fine Arts degree at Central Institute of Nationalities in Beijing China. 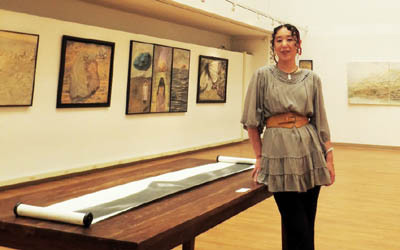 In 1988, after graduation, she had a successful exhibition at China Museum of Fine Art in Beijing. The exhibition drew public attention and Chinese Culture News, CCTV, China News, and Peoples Daily reported the show and reviewed it approvingly. In 1988, she was invited by Signet Fine Art, the School of the Art Institute of Chicago, and the Governor of the state of Illinois for the exhibition of The Selected Contemporary Oil Paintings from China. Ever since her first exhibition, her work continued to be exhibited in many group and solo shows nationally and internationally. The Three Sisters Show including works from Ling, Bo, and Hong was presented by University of Oklahomas Lightwell Gallery, Three Sisters Bound to the Elements with her sisters Bo and Hong at CSU Sacramento, California, Malone Gallery of Troy University in Alabama, Lamar Dodd Art Center of LaGrange College and Cochran Gallery, Whitespace in Atlanta, Sakata Gallery in Sacramento, University of Oklahomas Lightwell Gallery. An exhibition with works from Ling and Bo were presented at Sylvia Schmidt Gallery in New Orleans. Passport to Celebrations in Atlanta History Center. Ling made the numerous trips to Tibet, and she believes that the mysterious and surrealistic Tibetan Lama religion deeply influenced the artistic creation in her life. Conceptually, the principal focus of her work is the conflicts between human instinct and lofty ideals, and the question of what is fantasy and what is reality. Spiritual transformation and personal life experiences play a large role in her art.